A third case of African Swine Fever has been reported on a farm in the Haizhou District, part of the city of Kianyungang, in the Jiangsu Province (see map below). This area is about 350 miles east of the second case reported Aug. 16 at a slaughter plant in Zhengzhou, Henan province. In this latest case, on Aug. 15, pigs were dying from an unknown etiology on one farm in the Haizhou District, Lianyungang city. In this case, there have been 615 pigs reported as infected with 88 pigs having died from confirmed ASF. A work group was dispatched to the region by the Ministry of Agriculture and Rural Affairs where a strict blockade was implemented. In addition, disinfection, killing and disposal of animals, and relevant contaminated materials occurred. And movement control measures were put in place on the farm. The local government launched the ASF contingency plan and emergency response according to the Standards & Protocols for ASF. All live pigs and animal products were prohibited from entering or exiting the area. 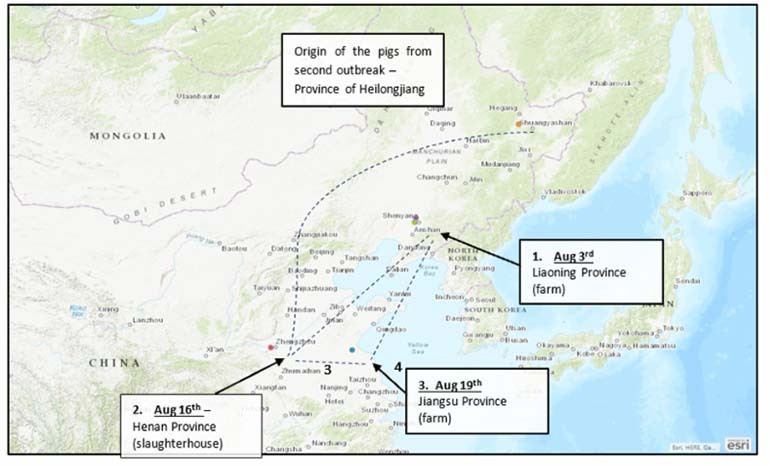 The three cases now reported in three provinces, and a 4th northern province related to the second event, have occurred over a large swath of China, containing tens of millions of pigs, according to SHIC. This map details the recent ASF finds in China. Figure 1: Distances by road from different points: 1: = 870 miles (1,400 km); 2= 1,400 miles (2,253 km); 3: 350 miles (563 km); 4: 800 miles (1,288 km). "After the African swine fever (ASF) outbreak, a supervision work group was promptly dispatched to the Jiangsu Province by the Ministry of Agriculture and Rural Affairs. Strict blockade, disinfection, killing and disposal of the animals and relevant contaminated materials, and movement control measures were conducted in the farm. The local government launched the African swine fever contingency plan and emergency response according to the Standards & Protocols for ASF. All live pigs and animal products were prohibited to enter and exit the area." Pigs in China are reared across a wide range of farm types including units similar to modern U.S. production systems. However, much of the pork consumed is still from small household units fed the food scraps of a family or neighborhood. And the slaughter and sale of pigs is often through modern slaughter facilities and supermarkets, but much of the pork is sold without refrigeration, with local slaughter and sales from neighborhood vendors, SHIC explained. The swine industry has never seen an ASF outbreak in such a production landscape, and control measures are untested, SHIC added. The Chinese industry has had difficulties in controlling FMD and CSF, and has relied on the use of vaccines. As a vaccine is not available for ASF, the industry is thus reliant on heightened biosecurity, rapid diagnosis, complete isolation and elimination of infected pigs and contaminated materials.